I decided to forego the knock-and run antics that give this Cornish event the Monday before Lent it’s name, and instead focus on the traditional meals that accompany the roguery. The options (according to wikipedia) were hearty pea soup or fresh seafood known as ‘trigg meat’. I’ve been eyeing up the fresh mussels in the supermarket for a while now, so this seemed a good chance to give them a go. I went with the recipe on the packet: 1. clean beards and any dead mussels out. 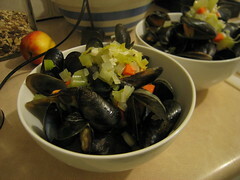 2. add mussels, 1/3rd bottle white wine, 1/3 block of butter, a small carrot, leek, celery and onion – all chopped small, black pepper, bay leaf to a big pan. 3. with the lid on, bring to a boil over a high heat, and steam for 5 mins. 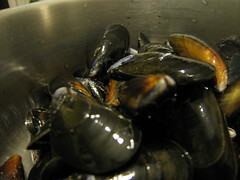 4. spoon out mussels and then reduce stock before pouring over. Not quite the traditional Cornish cooking method I’m sure, but tasty all the same. Speaking of which, does anyone know the traditional UK ways to cook mussels? During the 17th century, Scottish university students lived in very basic accommodation and were required to bring their own fuel, faggots or peat, to maintain a fire. 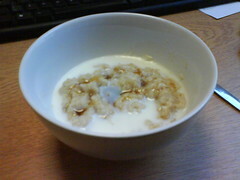 Their diet was meagre too, largely consisting of oatmeal, which they would make into porridge. … As the students’ country homes or farms were some distance from the city Universities, an occasional long weekend was scheduled to permit them to replenish their supplies. This tasty little pastry (Runebergintorttu) is named after a Finnish poet Johan Ludvig Runeberg (1804 – 1877) who is perported to have enjoyed one with coffee each morning. They are traditionally eaten running up to and on Johan’s birthday, 5 February. I jumped between a number of similar recipes while cooking these. 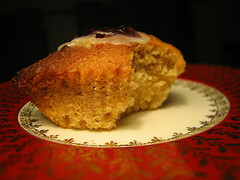 What you end up with is a moist muffin with overtones of almond, cardamom and rum. The raspberry jam and lemon icing are a tasty addition too. I’ve eaten two this evening already, cos I can’t wait until breakfast. And yes, I know, these are a day late, but there was no chance of concerted baking on a Friday. If you want to know what Runeberg’s poetry sounds like, there’s a short recording of Rakastava as part of a multilingual librivox poetry collection. I threw some beans out of our door. I also had a go at shouting “Oni wa soto! Fuku wa uchi!“. Why? Today is the Japanese Bean throwing ceremony, Setsubun, that marks the start of each season. At the start of the year I had the idea of trying to appropriate as many festivals as I could, preferable ones involving food. I’m a big fan of those small celebrations unique to one place or community, like the tomato fight in Buñol in Valencia, and this is really an exercise in trying to seek more traditions of that sort out. I thought I’d test the idea out on the month of February. So I sat down with wikipedia’s list of observances and drew up a calendar of possible days. I’ll let you know how I get on.